Much more than just a school [We aim to perpetually innovate in order to provide aspiration, inspiration and new ways to work with young people, parents and our local community. We therefore offer an expansive educational experience: Apex Construction Skills Centre, Park Farm, PDP; Print and enterprise unit and Inspired Education, SCITT and Solent Teaching Alliance]. Success for all through attainment, resilience and autonomy [We aim to ensure that all of our students are well prepared for the next step of long successful lives; demonstrating finish, polish, panache]. We are guardians of the flame; kindling fires [“At Park we will be at your child's side every step of the way, guiding them as their character develops and as they make their own discoveries about what they love.” We believe education is a way to change lives: to kindle fires and awaken possibilities]. Love to teach: joy, glee and delight [We believe all learners should be welcomed, inspired, challenged, and invested in as individuals, we also believe all staff should model passion for Park so students and their families experience joy, glee and delight]. We believe that we make a difference and that qualifications alone are not enough we believe in empowering students to feel confident, be independent and make good choices [existentialism] within a caring and sharing community. 100% face to face contact with parents each academic year to secure support for all students’ progress. All parents are contacted within 2 working days, wherever possible, regarding any concerns about their child. Parents contacted via texts and phone calls if a student is absent. All parents contacted about any incident their child may be involved in. Parents are able to arrange a meeting at any time if they have concerns re their child’s welfare. All parents will receive a data-based report on their child’s progress 4 times per year. All parents will receive a clearly written full report on their child’s progress once per year. The report will explain simply and clearly what has been studied, how the student has made progress and what precisely s/he needs to do to improve. All parents to be actively encouraged to attend a Parents Evening to discuss their child’s progress with subject teachers once per year. In the case of year 8 this will be part of the options process. All parents actively encouraged to attend Student Review Meetings to discuss their child’s progress and academic targets with mentors twice per year. All parents in year 11 invited to attend additional parents’ evenings aimed at helping them to better support their child’s aspirations and examination success. Termly attendance clinics for targeted students to discuss attendance issues. Early morning phone calls for those students who are attendance concerns. Pastoral drop-in for parents to discuss any welfare concerns. Revision sessions for Year 11 parents and students. We run a project called MUNCH which ensures that no child, no matter what school or age need go hungry during the holidays. This is being expanded to Thursday tea times and Sunday lunches. Parents are given the opportunity to enrol their child for a week’s Summer School to aid transition. Parents can hire our excellent facilities at affordable prices. We offer a whole range of affordable children parties to enable our children to have a party with good quality equipment in a safe environment. We have established our Student Recruitment Agency which creates paid work opportunities for our students from Year 7. Range of events are provided for example, 6 weeks of Christmas magical festive programme, Family Picnic in the Park, fundraising events. Courses run in the Dickinson Centre ranging from parenting skills to first aid. Monthly pastoral informal support sessions. Open 51 weeks a year open until 10pm – staff available to assist parents. Funding applied for to the benefit of families and students. We all have different skills, tastes in music, and life experiences, to name a few. 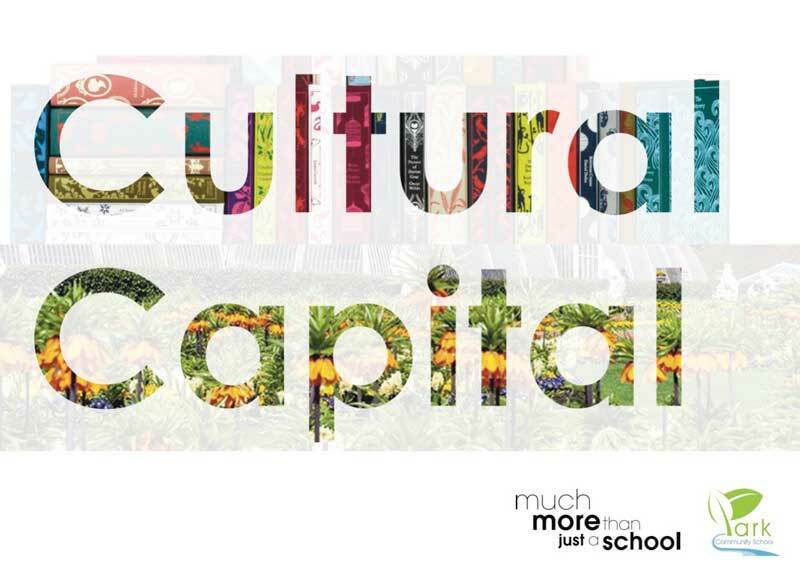 So why is cultural capital important? Our cultural capital gives us power. It helps us achieve goals, become successful, and get on in life, without necessarily having wealth. This booklet has been designed to inform our parents and carers how they can help support their child within each subject at Park Community School. It outlines websites to look at, visits and cultural experiences your child may enjoy out of school hours to support them in their education, along with recommended books to read.